You are here: Home / Miscellaneous / Avatar contest winner! 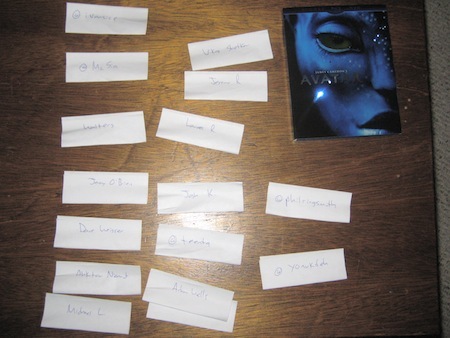 Congratulations to Angela and Maia Walter, who won our Avatar DVD/Blu-ray giveaway! The two of them submitted only one entry, and theirs was chosen by my wife (all the names were put in a box, mixed up, and my wife picked one at random without looking) shortly after the contest ended tonight. All the entrants of our Avatar contest, along with the prize itself. Thank you to all 16 individuals who entered the contest! 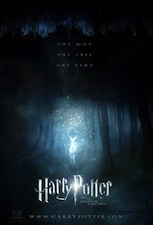 To everyone who suggested movies for us to review, we’ll try our best to accommodate your ideas. :) And thanks to all our readers for a great first year of Walking Taco movie and TV reviews. Here’s to many more!